Your relationship with God is the one you wanted! Then the texts begins a simile describing how this person is like a tree planted by water. It continues to grow and never needs anything as it has been planted in a place where all its needs are met (Ps. 1:3). The idea is that our knowledge of God has a huge factor in determining whether or not we have a strong relationship with him. When we think of any relationship, we know it takes time to develop. The relationship between a mother and baby takes time and continues throughout each ones life. That baby grows in his relationship with his mother as he begins to learn who she is, what she does and how she acts. After a while, no one could tell that child anything about his mother that he hasn’t already experienced. He knows his mother as a great source of help, encouragement, love, care and the like. You cannot tell a young child anything negative about his parent once he has truly gotten to know that parent. Think about your relationship with your own children if you have them. My children are old enough to have formed their own opinions about me long ago. If someone told them that I was a “dead-beat dad” they would be offended, categorically deny it and probably start fighting if the conversation continued (well, hopefully not fight, but you get what I mean). Over time, my relationship with my children has developed to the point where I am their source for everything! I’ve been God-like to them. The whole point is that as they know me as their “father”, it’s easier for them to understand the concept of God being their “Father in heaven.” I believe that a dad’s job is to build a relationship with his children that will allow them to understand some things about God. That means the dad has to be loving, giving, have self control, long suffering, nurturing, trustworthy and knowledgeable. 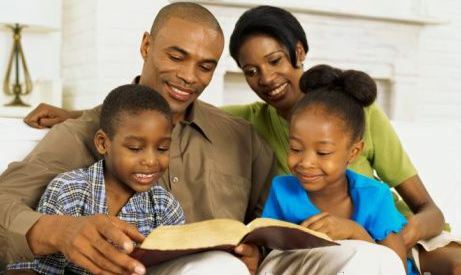 Children should see their dad faithful to them, spiritually, mentally, emotionally and physically. The dad has to be as good of a provider as his faith is to God. His children’s needs should be met — this doesn’t require every father to be rich, but it does require him to provide a living to secure his household or be the “house band” (this concept is where we get our word “husband”). Until he is able to do that, he should not marry or have children. How can you as a dad or mom or anyone profess faith in God without knowing him? The relationship built between a parent and child should mirror the parent’s relationship with God. Since our God doesn’t turn us away, our relationship with Him is what WE made it. So how is that working for you? Previous Post Lose all those guilty stains! Next Post The whole equals the sum of it’s parts? Morning brother, this post really hit home with me… My dear, sweet mother would recite Psalm 1 every night before she would go to sleep…..Next week will be four years since she’s passed….Everything I am as a mother, wife and Christian I have seen, and witnessed from my dear mother….Keep up the work for the kingdom!!!!! !